“When they ‘gon make that Bentley truck!”. Move over Escalade, out of the way G Wagon! …Well, not quite yet, as the Bentley EXP9F is only a concept vehicle, and touted by the Ultra Luxury automaker as a crossover. The end all be all when it comes to Big Boy Toys, Bentley only introduced this all wheel drive 6 Litre W-12 cylinder “statement car” at the 82nd International Motor Show in Geneva this week as a teaser to gauge interest and demand from it’s customers for such a vehicle. They will [of course] refine, and re-refine it before ever bringing this definitive replacement to whichever SUV currently resides in your personal collection of luxury and exotic automobiles. Designed to be the “absolute pinnacle of the SUV sector” It’s sculptured muscular body makes much more than a statement. Can’t wait to cop one? You’re going to have to. No word yet on production plans or on the $000,000.00. Rest assured, this is out of reach for y’all thousandaires out there, this ain’t the type of ride you carry a note on. Get your million’s up! 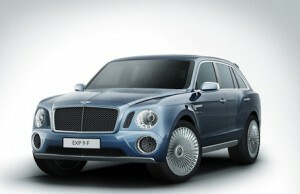 You have a little time, because for now we still don’t know when they ‘gon make that Bentley truck.